Exceptions apply, rates may differ for an abnormally heavy pin or a full pin set. Chip, the teacup, only. He is looking up with a smile. Exceptions apply, rates may differ for an abnormally heavy pin or a full pin set. 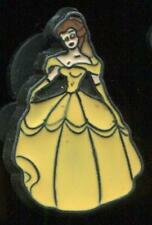 This pin features Beast standing in his blue formal suit inside the Be Our Guest Restaurant ballroom dining room. A green curtain and tables with chairs are seen in the background. Exceptions apply, rates may differ for an abnormally heavy pin or a full pin set. This pin shows a side view of Mrs. Potts with Chip at her side, it is a fairly small pin that reads: Disney China on the back.Its the fifth in the GWP series. Exceptions apply, rates may differ for an abnormally heavy pin or a full pin set. Exceptions apply, rates may differ for an abnormally heavy pin or a full pin set. Make Supersized Seem Small. Bold white "I", red heart with Belle in her gold ball gown holding a red rose. The words Belle in yellow letters. Exceptions apply, rates may differ for an abnormally heavy pin or a full pin set. Limited Edition 500. A pin on pin diecast silver/pewter beast is standing in front of a gold door with recessed details. The beast pin is part of a five pin set from the movie that are exclusive to the event. Exceptions apply, rates may differ for an abnormally heavy pin or a full pin set. It is a jeweled/marbled roce. The rose is a marbley red with gold accents with two jewels, one red, one gold. Exceptions apply, rates may differ for an abnormally heavy pin or a full pin set. 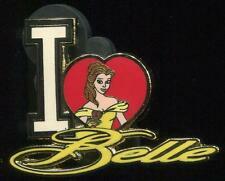 Lumiere, the Feather duster, Cogsworth, Mrs. Potts, and Chip are seen in this pin. Exceptions apply, rates may differ for an abnormally heavy pin or a full pin set. Limited Edition 150. This enchanted Beauty and the Beast three pin set consists of the Beast's rose, Cogsworth the clock, and Chip the teacup. Exceptions apply, rates may differ for an abnormally heavy pin or a full pin set. Exceptions apply, rates may differ for an abnormally heavy pin or a full pin set. Limited Edition 500. Wooden Toys. We have over 20 years of experience and have a passion for making kids of all ages smile. We hope you will enjoy the experience. Account Number - 1034 5866. Account BSB - 063 194. Bank - CBA. It hasn't broken off or been repaired but it is wobbly. I can’t see any crazing that is noticeable but these pieces are known for varying levels of crazing due to being porcelain so I just want to note this in case I missed it. Inspired by Disney's animated classic Beauty and the Beast (1991). Satin ribbon for hanging. On/Off switch on base. Lumiere "Ooh La La"Model No Lumiere stands approx 12cm. Disney Traditions combines the magic of Disney with the festive artistry of sculpture Jim Shore's Heartwood Creek. This Disney Traditions Ooh La La is made from cast Poly Resin and hand painted with wood effect which makes each item a little unique from the next. Cogsworth stands approx 11cm. Disney Traditions Combines the magic of Disney with the festive artistry of sculpture Jim Shore's Heartwood Creek. We have over 20 years of experience and have a passion for making kids of all ages smile. Item code: 4049621. Money Order. Account Number - 1034 5866. Account BSB - 063 194. Bank - CBA. Officially Licensed Disney Beauty and The Beast Lumiere Ooh La La Figure. Officially Licensed Disney Beauty and The Beast 'Tale As Old As Time' Figurine. Official Disney Traditions Jim Shore Beauty and The Beast Love Endures Figurine. Official Disney Belle and Beast Moonlight Waltz 25th Anniversary Figurine. Officially Licensed Disney Mrs. Potts and Chip A Mothers Love Figurine. Smaller pieces can rest in Chip and your larger pieces can be put on the saucer. This jewelry dish looks just like Chip and is not only adorable, but highly functional. Type Jewelry Tray. Material Ceramic. Disney Traditions Beauty and the Beast Hanging Ornament - Disney Showcase. Have faith in your dreams and be inspired by this hopeful heroine! Despite her circumstances, she remained compassionate and optimistic. Disney Traditions. Little People Direct. Account Number - 1034 5866. In good to very good played with condition. I am listing the complete set from 2004, all are in good to very good condition and have the original box and booklet. The original box clear cover has yellowed with age and some boxes may have tears or creases. Please use all photos as a buying guide as they form part of the description. Please ask all questions prior to purchasing. WDCC Beauty And The Beast Mrs. Potts & Chip Good Night, Luv W/ Box Has Crazing. IT IS NON-NEGOTIABLE. Crazing: The base of this piece is covered in crazing. It still looks cute but the crazing can be seem upon closer inspection of the piece. Thephoto's are of the actual item you are purchasing. Designed by Jim Shore for Disney Traditions. The book title is written in gold paint on the back of the book. Jim Shore Disney Traditions. Made from hand painted Stone resin, Unique variations should be expected. Beauty And The Beast. Collectable Plastic Mug. Has a couple of little blemishes on the cup. Here is a lovely item for your collection. Officially Licensed Disney Traditions Cogsworth Keeping Watch Figurine. Beauty And The Beast. Collectable Tin. The tin is empty, no book inside. Official Licensed Disney Showcase Miss Mindy Lumiere Collectors Figurine. Love Endures. (Beauty & The Beast). Disney Traditions combines the magic of Disney with the artistry of Heartwood Creek by Jim Shore. Disney Traditions. Width: 20.0 cm. 1st Quality. Height: 15.5 cm. Beauty and the Beast Snowglobe. As the Beast gently holds two little birds in his big hands, Belle discovers a side to him she hadn't seen before. Fully sculptured snowglobe. Characters include Belle, Beast, Lumiere, Mrs. Potts, and Cogsworth. Each piece is hand painted and slight colour variations are to be expected which makes each piece unique. Showcase Collection. Walt Disney. Height: 27.0 cm. An elegant reproduction of the iconic ballroom scene, this handcrafted "Beauty and the Beast" waterball is a stunning collector's piece. The stone resin base features a quilted design, gilded rose trim, and crystal details. Couture de Force Belle (Wedding)Model No This stunning piece is made from stone resin and stands approx 20cm. Each piece is hand painted, making each one unique and different from the next.